Everyone knows that lettuce will make you skinny and chocolate will make you fat (lettuce is still a negative calorie food, right?). But what if you really want to eat the chocolate cake? What if you don’t eat the chocolate, you force yourselves to eat the stupid lettuce leaves, and then three days later you go on an epic binge that lasts for 2 weeks, 3 weeks, 6 months? The media is not about to stop telling you that if you don’t look like an Instagram celebrity, then you are sure to die. Alone. With a hundred cats and no children. But there’s nothing wrong with you just because your booty looks like it came from a cronut rather than a Kardashian. The more you think, “I can’t eat this but I can eat that,” the more you are going to continue screwing yourself o er. The Snickers bars, the M&M’s, the cheese cake, the chilli fries, the 14 pizzas. 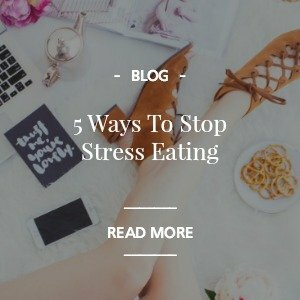 You go into a state of panic because you feel like you’ve been without the food you love for so long that you deserve to eat A LOT of them. If you believe you CAN eat the chocolate muffin, then you can actually decide whether you WANT to eat it or not. When you stop trying to get your eating “perfect”, the game changes. Give your body the space to enjoy the foods that you enjoy, in the amounts that feel good to you and to your body. Don’t feel that you need to stuff them down when you have them available just because, “If I don’t eat it now I’ll never get it again,” “It’s my one cheat day a week or my free day a week so I need to eat it now, otherwise I’ll never see it again for another whole 7 days!” Those thoughts are like poison. They will drown you in cake crumbs every time. So you are pizza? So freakin’ what?! Punishing yourself the next day with crazy long workouts to try and get those calories off your backside is no fun. You don’t need to be somebody else or look like somebody else to be happy, to be okay with you who you are and to be in love with yourself right now. You can be perfectly happy exactly as you are, with what you have, and how you look. The problem is not YOU. The problem is the media who tells you that’s not possible. There’s nothing wrong with you. There has never been anything wrong with you. There never will be anything wrong with you. You look EXACTLY how you are supposed to look. If you were supposed to look like somebody else you would. End of story. You’re not going to reach some magical weight and suddenly become deliriously happy with your body. 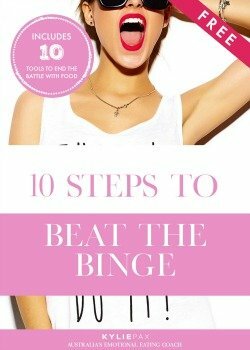 Most likely, you want to binge as a way to rebel against the constant restriction. You can be happy on the way to where you’re going. Remember, you can’t RECEIVE what you don’t RESPECT. Have you ever punished yourself or restricted your food after a binge? How did that work for out for you?